We all might have heard a story of a guy who got in shape with virtual reality. Just in case you’ve never heard of him, he was doing a 50-day of VR fitness, and, surprise, he got in shape. But that’s just not it. According to a study done in 2014, it’s said that virtual reality can improve physical fitness and body composition. And, as simple as we can see it, some experiences in virtual reality require us to move. Whether it’s a simple swinging, walking, running, punching, and even dodging. Count how many calories burned there. So, if you feel like lazy to go to the gym, virtual reality might be a perfect fit for you. Let’s call this thing VR fitness. In this article, we have listed 12 VR fitness to get you in shape from home. This list includes paid VR fitness apps to free VR fitness apps, for Vive, Oculus, Android, and iOS. P.S. The order below is set randomly. Start your VR exercise with Audioshield. Audioshield will take you into a futuristic arena where you will hear your favorite song. However, make sure you hit all the orange and blue splattering around in front of you. You have to hit them hard and fast and never miss any of them, and that’s how you loosen up your muscle and get your heart pumping before the real exercise in virtual reality. How many calories burned in this VR game? According to the editor of chief of VRFitnessInsider.com, playing Audioshield for 20 minutes would very likely help you burn more than 150 calories, the average amount for an equal amount of time of very moderate, simple calisthenics. Fact: Tim Donahey, the guy who got in shape with virtual reality, also played Audioshield for warming up, ten minutes each day in the final week of his 50-day challenge. If you want something similar to Audioshield but a little cheaper, Soundboxing could be good to go. Basically, the gameplay is no different to Audioshield, but it has some different moves and different interface where you can watch the music video while the music is playing–you will be more focused on the notes you have to hit with your swing, though. This is too cute for an exercise, yet it is a real workout. Just like the mobile version, you have to slice all the good-looking fruits with your hands. But, in VR mode, you use your hands like you’re holding a samurai, so you’re like swinging your hands wider than you did on Audioshield and Soundboxing. 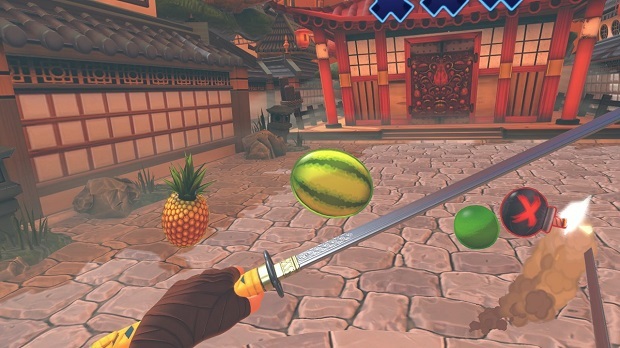 Download Fruit Ninja VR on Oculus here. Download Fruit Ninja VR on Steam here. We all have the excuses not to do jogging: It’s too cold. Too hot. Not feeling it. If that’s the case, you can turn your room into a virtual maze. You will be trapped inside and you can’t go out unless you walk or run. You can jump as well to see the whole maze. Thanks to virtual reality, it’s now possible with a VR exercise app called Wizard Academy VR. It’s not meant to be an exercise app (it’s actually an educational VR application), however, the ability to walk, the fact that you have to walk a lot (depends on the level, though), and the fact that walking can burn your calories makes Wizard Academy VR deserve this spot. To be able to walk in the virtual environment, you have walk in place in real life. If you want to run, then run in place. Same goes with jumping. In my experience, you will be more like doing jogging, as it’s a little bit too slow to walk and a little bit too fast to run. According to Harvard Heart Letter, jogging less than minutes can burn 180 calories (for a 125-pound person), 223 calories (for a 155-pound person), 266 calories (for a 185-pound person). You can download Wizard Academy VR on Play Store or App Store for free. It requires a low-cost VR glasses, such as BeThere VR Book. Available for worldwide shipping here. Also available at your nearest stores in Saudi Arabia, such as Jarir Bookstore, Virgin Megastore, iZone. Snap the QR code to get all the sporting content in VR and 360 video. Download Wizard Academy VR for Android. Download Wizard Academy VR for iPhone. Now let’s get a little intense. Thrill of the Fight is the definition of VR in boxing. So, yes, it includes punching, swinging, blocking, dodging and ducking. Even though in real life you only punch the air, it’s the repetitive movement and the use of same muscles that will burn your calories. Even when you punch a bag, that’s not a bag that will create the burn feeling and fatigue in your arms, shoulders, and core, it’s your repetitive muscles and the use of same muscles, said Kendal Wood, certified personal trainer. According to Harvard Heart Letter, boxing (sparring) for thirty minutes can burn 270 calories (for a 125-pound person), 335 calories (for a 155-pound person), 400 calories (for a 185-pound person). Download Thrill of the Fight on Steam. Download Knockout League on Steam. If you’re angry, this VR game is definitely for you. Have fun to punch your enemies real hard, shoot them with your archery, and try many weapons as you can. At this stage, it doesn’t feel like exercising, yet it takes your energy. And, it turns your anger into burning calories. If you like Gorn VR, surely you will like this one. In Sword Master VR, you will be surrounded by your enemies, and they’re not easy to die, so you have to swing your sword as fast as possible, as hard as you can, or you’ll die. After playing this game, you’ll realize how you’re running out of breath, and that’s when you realize you just did another exercise in virtual reality. Download Sword Master VR on Steam. You will be a goalkeeper this time. And, just like any goalkeeper, you have to use your whole body to jump to the left, to the right, up and down to catch the ball. You can actually track your movement by gaze-tracking, however, (1) it might be pretty hard and tiring for your neck, (2) If you can make it fun, why don’t you? You can use a $26 VR glasses to do a little workout with Final Kick VR, such as BeThere Book. Download Final Kick VR for Android. Download Final Kick VR for iPhone. It’s time to cool down. Holopoint is like the combination of archery and boomerang. When you release your arrow to the object, the object may come back to you like a boomerang, and you have to avoid it. So, let’s see how many things you do here: stretching your muscle to do the archery that targets your back and shoulder, twisting and dodging that hit your core, fast-paced spinning and total body alertness and motion that makes this experience feels like a cardio. This might be exhausting, but it’s worth it. According to Harvard Heart Letter, playing tennis for 30 minutes can burn your 210 calories (for a 125-pound person), 260 calories (for a 155-pound person), 311 calories (for a 185-pound person). “Most beginner Ping-Pong players will burn between 200 and 350 calories per hour of play,” according to Lisa Feldermann, personal training program manager at Blink Fitness in New York. Again, thanks to virtual reality (specifically, Pong Waves VR), you don’t need to buy a Ping-Pong table and its equipments and get confused where to put them all, yet you can still play it like in real life and burn some of your calories. Download Tennis Table VR on Steam. What are your good-to-go VR fitness games? Share on the comment below. ► Like this post? Share it to your friends and let them know about VR fitness. ► Want to get updated about VR? Join our social media: Facebook, Twitter, Instagram. BeThere is a virtual reality brand developed by Visual Experience. At BeThere, we aim to bridge the gap between virtual reality and mainstream audiences in terms of VR hardware and VR content. For hardware, we offer a fully customize VR brochure/book/glasses for brands. For content, we mainly develop interactive VR apps and 360 panorama/videos. We have successfully worked with big corporations/organizations, such as Samsung, Sabic, Abu Dhabi Tourism Authority, Okaz. One of our works, Makkah Window, was awarded by UNESCO for an innovative app in tourism and culture. Disclaimer: It’s strongly recommended to contact your personal trainer or to share on the VR fitness forum, so you can get the right result. In Tim Donahey’s case, he himself is a personal trainer. Read more about his VR fitness experience here. ← Goodbye, Old Marketing. VR Brochure Is Going to Take the Lead.